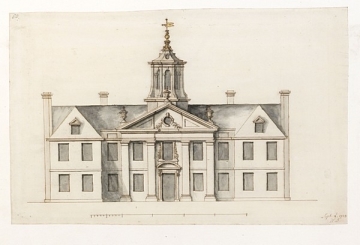 In this final design for the house, Dickinson enlarged the cupola, repositioned the chimney stacks and extended the roof across to the end stacks (as indicated in pencil on his initial design, 2). The most significant change was to the applied portico. He removed the first-floor loggia and broke the entablature and tympanum back in a shallow recess over the central bay, as Wren had done in his upper transept fronts at St Paul's Cathedral. The entrance door and first floor window are enriched with aedicule and console frames while the entablature is left plain, giving added emphasis to the central bay. The two-window pyramid-roof pavilions at were probably duplicated on the river elevation, for pavilions of this size were built in the completed scheme, recorded in a sketch in 1737 (Brindle, op. cit., fig. 7). This sketch shows two buildings joined together, the right one six bays long with a full-height canted bay one window from the right end, and the left one in three pyramid-roofed blocks, the central of which has the three-arched loggia and upper floor Venetian window of Campbell's final design, published Vitruvius Britannicus. It is possible, therefore, that the outer bays of Dickinson's scheme were incorporated in the building as executed, and that the new building was intended from the outset to join with another on the site (see Brindle, pp. 92-96).